The Classical Model assumed that aggregate supply would always equal aggregate demand, in essence, because of Say’s Law: supply creates its own demand. While in the mid- 19th century to the late 1920s there had been a series of ‘depressions’ – extended troughs in the business cycle – they had not lasted long enough in any one country nor embraced all countries at the same time. Prior to WWI it can in fact be argued that the level of ‘globalization’ was in fact greater than even today but it was characterized by a significantly greater ‘division of labour’. Thus ‘industrial’ manufacturing tended to concentrate in western Europe and the United States while the rest of the world served essentially as a source of raw materials and markets for goods manufactured in the ‘developed’ countries. The ‘mercantilist’ policies of the European colonial powers strived to ensure this division of labour. With the Great Depression of the 1930s, however, the trough was both long (1929 to 1939) and extensive, i.e. the entire world suffered. The productive capacity of the developed nations in effect vastly exceeded the demand for their manufactured output. Similarly, much of agriculture and the other primary industries around the world had an enormously greater output than demand. Unemployment (of labour and other factors of production) was so great that political revolution was in the air. It soon became clear that the Classical Model’s confidence in the equilibrating power of perfect price and wage flexibility was misplaced. Large scale industrial enterprise and industrial trade unions both presented rigidities to the automatic re-establishment of full employment and output. The change in industrial structure was highlighted in Gardiner Means and Adolf Berle's path breaking text The Modern Corporation and Private Property in 1932. Something had to be done but what? John Maynard Keynes offered the answer for the ‘liberal democracies’ in his General Theory of 1936; Mussolini, Hitler, Stalin and Tojo offered an alternative answer for totalitarian states around the world. · the aggregate price level is fixed and therefore all variables are ‘real’ and all changes are ‘real’ changes. 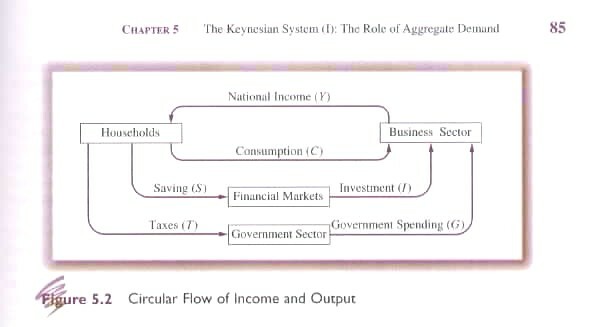 A central objective of the Keynesian Model is to insure that aggregate output (Y standing for supply) equals aggregate expenditure (E standing for demand), i.e. Let us quickly examine the implications of these three equilibrium conditions. First, Equation 6.2 implies that production of Y generates an equivalent level of income for households. Part of this income returns to firms: directly through the purchasing decisions of consumers (C); indirectly through the investment of consumer savings by firms; and, indirectly through the purchases of goods and services from firms by government (G) that is financed by taxes levied on households. In both Equations 6.7 and 6.8, firms will change their output decisions for the next planning period. If there are higher than desired inventories, output will fall; if there are lower than desired inventories, output will increase. The question remains: what is the desired level of inventories? This question in the Keynesian Model is answered by the experience of firms over many time periods. They learn that a certain level is optimal to allow for fluctuations in demand. iii - government spending (G). Consumption accounts for 60 to 70% of aggregate demand. 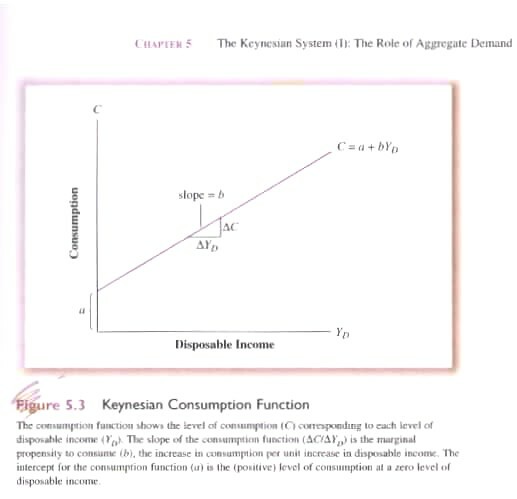 Keynes believed consumption was a stable function of disposable income, i.e. after tax income (YD = Y-T) where “T” represents ‘net taxes’, i.e. taxes minus transfers from government, e.g. UI payments. Other factors can influence consumption, e.g. expected increases in income or wealth as well as expected price changes. Such factors are not, however, generally considered significant. In summary, consumption is ‘induced’ by changes in the level of income, i.e. if income goes up C goes up and visa versa. With respect to the terms of the consumption function: “a” represents ‘non-discretionary’ consumption or ‘survival’ spending. Thus even if you earn no income you still must eat and satisfy ‘survival requirements’, clothing, shelter etc. And how is this possible? One way is by selling off one’s assets; the other borrowing from friends or family. Non-discretionary consumption is visible in 7th Ed Fig. 5.3 and 8th Ed Fig. 6.3 as the intercept of the consumption function with the x-axis; and, “b” represents the marginal propensity to consume (MPC) or the slope of the consumption function relative to disposable income. It measures the increase in consumption from a unit increase in disposable income. Keynes assumed that any increase in disposable income YD would be split between consumption and savings, i.e. the increase in consumption would be less than the increase in YD. It is important to note that for individual households MPC varies according to income level. Thus the rich have a lower MPC than the poor. For the economy as a whole, however, an overall MPC can be calculated. For Keynes the change in the desired level of investment (I) by firms was a critical variable in insuring Y = E. While C was considered an induced variable by Keynes (induced by changing Y), he considered I an autonomous variable that changed not in response to ΔY but for other reasons. 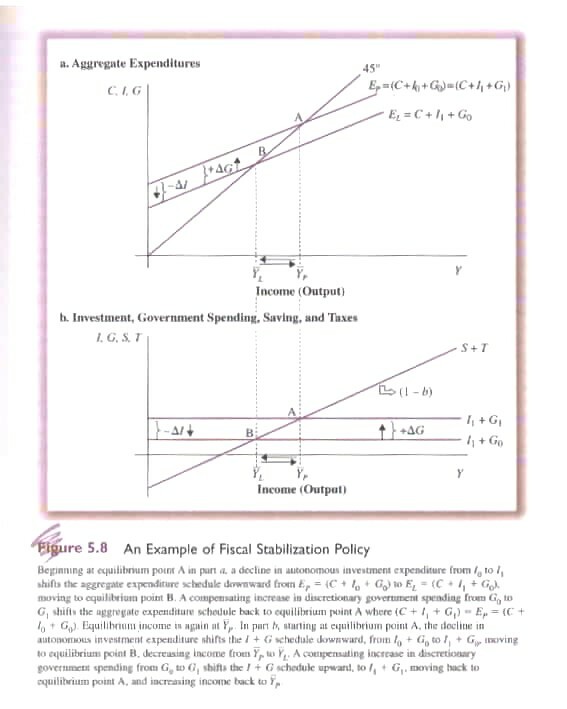 The two dominant factors in determining the level of I were the interest rate (r) and expected business condition, i.e. the expectation of earning a profit (π). The interest rate measured the direct or indirect cost of financing a project, i.e. investing. The anticipated profit to be earned was calculated relative to the cost of funds that must be paid to undertake the project. Given that an investment in a new plant may have to produce output for 20 or 30 years there are great uncertainties concerning investment. Some uncertainties are subject to ‘probabilistic calculation’; other, however, are what Keynes consider ‘true uncertainty’, i.e., there are risks involved. It was the willingness to accept these risks that Keynes’ summed up as ‘animal spirits’. Needless to say, such ‘spirits’ are fickle. As with I, Keynes assumed that government spending and taxation were not direct functions of income, i.e. they are autonomous not induced variables of Y. Both are in fact ‘political’ variables and hence not necessarily related to ensuring Y = E.
Y is the endogenous variable to be determined. Autonomous or exogenous variables: I, G & T are given from outside the model. Consumption, for the most part, is dependent or induced by changes in disposable income, i.e. In 7th Ed Fig. 5.5 and 8th Ed Fig. 6.5 we can see the resulting curve. On the x-axis we measure Y. Along the y-axis we measure components of aggregate demand (C, I, G). When we plot the consumption function we have an upward positively sloped curve that intersects the y-axis at the level of non-discretionary consumption (a-bT). 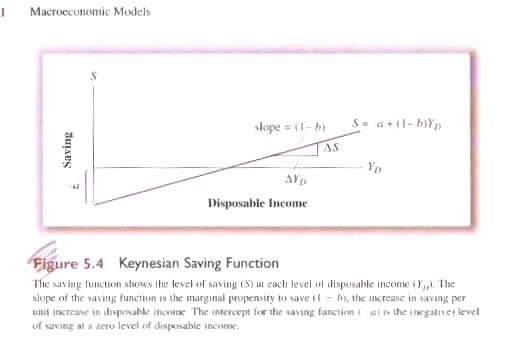 The slope of the curve is the Marginal Propensity to Consume (MPC = b) reflecting how much of income will be spent on consumption, and, by deduction, how much will be saved and available for investment purposes. If we add autonomous aggregate demand (I, G) they simply shift the consumption function up vertically by the exogenously determined value of I and G. The slope of the resulting Aggregate Expenditure Curve (AEC) remains the same as the Consumption Curve. I and G do not vary with Y. A 45 degree line from the origin marks all points where Aggregate Expenditure equals output. 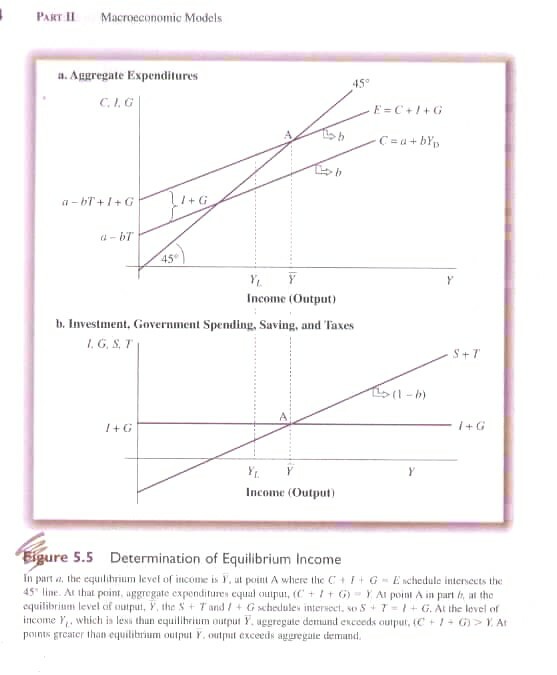 The intersection of AEC and the 45 degree line indicates where equilibrium will be achieved (A in 7th Ed Fig. 5.5 and 8th Ed Fig. 6.5). Any point above A and the AEC indicates that demand exceeds output and business inventories will be run down forcing the system back to equilibrium. Any point below A and the AEC indicates that aggregate demand is less that existing output and inventories will be built up forcing the system back into equilibrium. From Eq. 6.2 we know that Y = E = C + I + G, i.e., E = C + I + G. Replacing C using Eq. 5.9 we know E = a + bY – bT + I + G. Put another way: E = a – bT + I + G + bY where (a-bT +I + G) is the autonomous components of expenditure and the intercept while b is the slope of the curve, a coefficient of Y equal to the MPC. Every time an autonomous expenditure changes, Aggregate Expenditure will shift, vertically, by an equal amount reflected in the change of intercept. 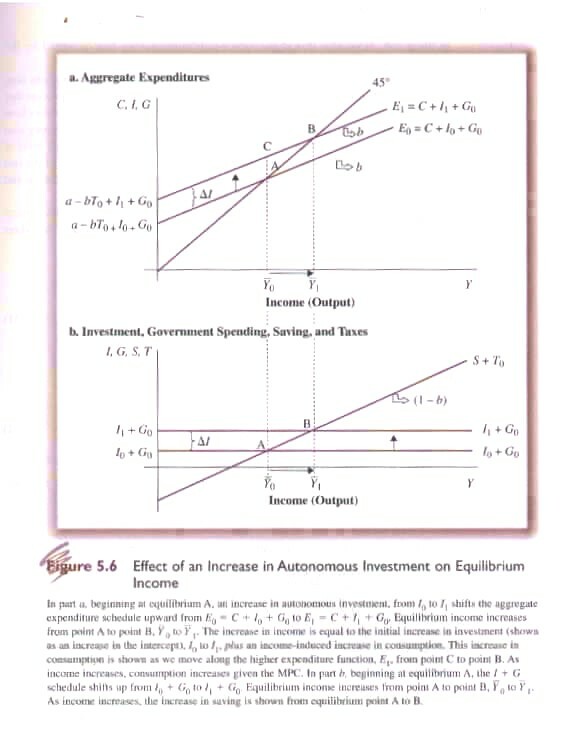 Equilibrium aggregate demand, however, will change by an amount greater than the change in autonomous expenditure. The first indication becomes visible by comparing the vertical change in aggregate expenditure (due to a change in autonomous expenditure) with the horizontal change in equilibrium output. 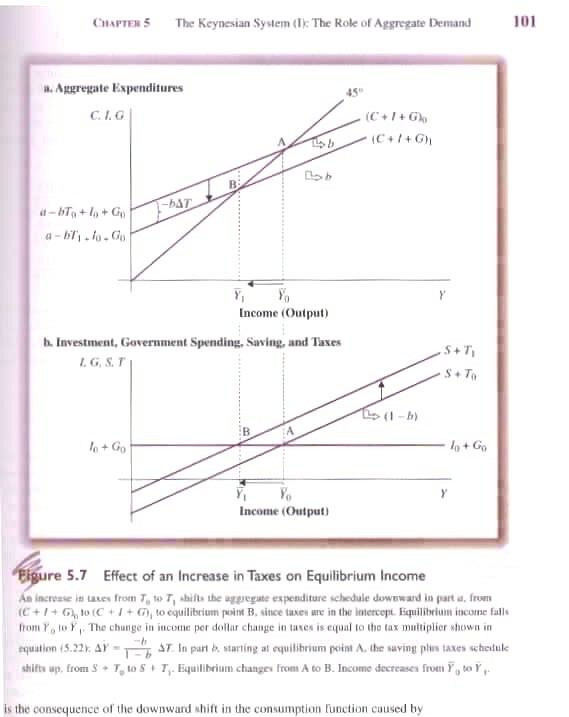 Due to the slope of the Aggregate Expenditure Curve the horizontal change will be greater than the vertical. How much greater? we can separate out (1/1-b) from changes in autonomous spending (a-bT+I+G). In fact 1/1-b is the aggregate expenditure multiplier where b = MPC. If b is less than 1 then the denominator is less than 1 and when divided into 1 will generate a number (the multiplier) that is greater than 1. That is any change in autonomous spending, especially usually more unstable investment will lead to a larger change in output equilibrium. It is important to note that in equilibrium it is assumed that I + G = S + T. If there were no government this would mean that I must equal S for equilibrium. One of Keynes criticisms of the Classical Model was that the ‘loanable funds doctrine’ was not necessarily true. On the one hand individuals might, due to fear and insecurity, hold cash without investing it. On the other, firms might be unwilling to invest as much as consumers are willing to save. This potential instability of investment lay at the heart of Keynes’ call for an interventionist government. There is a difference, however, with respect to a change in taxes, i.e. ΔT (Fig. 5.7). Given that changes in G or T can affect equilibrium income they can be used as conscious tools of macroeconomic policy to offset undesirable changes in I. In 7th Ed Fig. 5.8 & 8th Ed Fig. 6.8 we can see that a drop in I can be offset by increasing G.
Exports represent sales of current domestic production to foreigners. Accordingly it is part of aggregate demand. Imports, however, are purchases made from foreigners and not from current domestic production. In effect they represent a reduction in demand for domestic goods and services and are subtracted from aggregate demand. But what is equilibrium in an open economy? We begin as before assuming G and I are autonomous of changes in Y. C , however, is induced by changes in Y, i.e. But what determines exports and imports? Are they induced or autonomous to changes in Y? In the case of exports, demand is autonomous in that it is determined by foreign income not domestic; by the exchange rate and international prices, not domestic. In the case of imports they depend on Y, i.e. they are induced by ΔY like C, i.e. The implication with respect to the expenditure multiplier is clear. The higher the propensity to import (v) the lower the multiplier. This, of course, reduces the effects of changes in autonomous expenditures, e.g. G. In effect imports act a ‘leakage’ from the system. The more leakage the less leverage is available to government, monetary authorities and domestic forces to effectively exercise macro-economic policies.